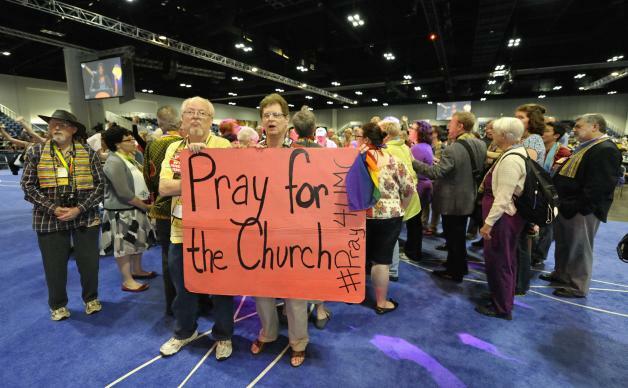 Organizers of The United Methodist Church’s top lawmaking assembly plan to offer an alternative process for considering legislation related to the denomination’s stance on homosexuality. To go forward, General Conference delegates will need to approve rule changes when they meet May 10-20, 2016, in Portland, Oregon. The Commission on General Conference, which plans the legislative gathering, hopes its Group Discernment Process might provide a template for dealing with other contentious issues in the life of the church. But right now, the commission’s focus is on a finding a different way to address a debate that has raged at each General Conference since 1972 and has led some United Methodists to raise the possibility of a denominational split. “What we’ve been doing hasn’t been working, so let’s look at an alternative,” said Judi M. Kenaston, the commission’s chair and conference secretary of the West Virginia Conference. One goal is to bring out the “middle voices” — those who typically don’t sign up for the legislative committees that deal with human sexuality and don’t speak up once debate gets going. Commission members, who themselves have varying theological views on homosexuality, don’t have a particular outcome in mind for the process, Kenaston stressed. “My dream would be that at the end of it, you would have a decision we could all live with,” she said. Under the plan, the first stop of all sexuality-related petitions would not be legislative committees. Instead, all delegates would review the petitions in small groups with no more than 15 members. The groups would each have geographical, linguistic, ethnic, gender and age diversity, along with a mix of clergy and lay. Even before General Conference begins, each conference delegation may nominate up to three delegates to serve as the small-group leaders. The executive committee of the Commission on General Conference will appoint the leaders from this pool. The leaders will go through training at the same time legislative committee officers do. The commission asks each small group to make recommendations on the petition. Members will have the opportunity to review and sign the recommendations. The groups will meet during the first week of General Conference. The Rev. L. Fitzgerald “Gere” Reist II, secretary of the General Conference, said he expects the process to give more people a chance to be heard. The next stop for the recommendations will be what the plan calls a “facilitation group,” which will meet the Sunday of General Conference. This group of six will have the task of crafting a comprehensive petition or group of petitions based on the recommendations. The full plenary will then take up the petition or petitions, likely on Tuesday. Commission members want facilitation group members to have a particular skill set — including the capacity to discern trends in the response sheets, solid writing ability and knowledge of legislative process and language. Impartiality also will be important. The Council of Bishops’ Leadership Discernment Committee will nominate one man and one woman from each U.S. jurisdiction and central conference (church regions in Africa, Asia and Europe) for the facilitation groups. From this slate of 24, the General Conference commission’s executive committee will select six who will be presented for election by the full General Conference. Delegates will have the option of nominating additional facilitation group members from the original pool of 24. Ultimately, the delegates will elect six by plurality. The process is similar to how General Conference delegates elect members of the Judicial Council, the denomination’s top court, and the University Senate, an accrediting body that oversees how seminaries and other schools relate to The United Methodist Church. In any case, General Conference delegates will have at least 24 hours to review the facilitation group’s work in the Daily Christian Advocate before debating it in plenary. The Daily Christian Advocate is sort of the General Conference version of the U.S. Congressional Record. The alternative process came about from the commission members’ desire to find a way to make decisions that might be more easily understood and to build consensus rather than use the usual parliamentary procedure. “Robert’s Rules (of Order) isn’t working for us all the time. There should be other alternatives,” Kenaston said. The idea to use small groups for discernment came from the Connectional Table, a United Methodist body of clergy and lay people from around the world. The Connectional Table acts as a sort of church council for the denomination, connecting its ministries and resources. The body is also working on its own legislation related to the denomination’s stance on homosexuality. The idea for a facilitation group originates with fellow World Methodist Council member, the Uniting Church in Australia. The Rev. Terence Corkin, general secretary of that denomination’s Assembly, gave a presentation on how the Uniting Church uses a similar group to help with especially contentious issues. The commission approved a basic outline of the process, but the executive committee was authorized to continue refining the rules. Kenaston acknowledged that at least for some United Methodists, an alternative process might be a tough sell. “No matter what we try to do, I think we battle the trust level,” Kenaston said. Delegates and observers often suspect a hidden agenda behind every part of General Conference. But ultimately, trusting and listening to each other may be critical to holding a fruitful legislative assembly, commission members said. Reist said he is hopeful this process will help more people feel like they have been heard. As secretary of General Conference, he said, he has held more than one person who was crying after a vote. Hahn is a multimedia news reporter for United Methodist News Service. Contact her at (615) 742-5470 or newsdesk@umcom.org.